Big Montgomery's Fort is the fourth level of the game Yoshi's Woolly World. It features lava and see-saw platforms, and contains the first mini-boss, Big Montgomery. The levels starts out by an Egg Block, before a section with some Ball 'n' Chains. Partway through this section is a platform that needs filling out, and this platform will allow the player to collect some beads, and if they jump to the right, they can get a piece of Wonder Wool and a Smiley Flower. The player then goes through a door to the next area. The next room has a checkpoint and some platforms made of wool, before leading to an area with Lava Bubbles, and see-saw platforms that need to be used to progress up the room. At the top of the room, the player will have to go across some more wool platforms, whilst avoiding some Ball 'n' Chains. At the end of the room is another checkpoint and a door. The next room has Monty Moles that jump out of the walls and Ball 'n' Chains, at the end of this room, the player will need to eat part of the floor to reveal the Boss Door. After going through the door, Kamek will cause Big Montgomery to grow in size and the boss battle will begin. Big Montgomery will move around inside a wall, then he will jump out onto the ground and start chasing Yoshi. The player will have to jump on his head after he comes out of the wall, and then Ground Pound on his rear. 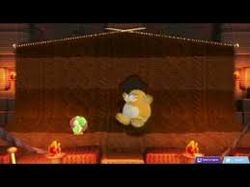 After the first hit, he will start throwing Spiked Balls every time the player hits or misses him; after this he will throw a Spiked Ball that bounces, and Big Montgomery will be defeated after the third hit. Smiley Flower #1: The player will find a bow which can be accessed by standing on a wool platform. Behind the bow is a passage. When the player exits the passage there will be a second bow on the way out. Lick the bow and go inside the hidden room to get the first Smiley Flower. Smiley Flower #2: After the second Wonder Wool, the player will find a second see-saw platform. This time, they tip it all the way to the right then jump into a small alcove to the left. Inside, there is a Winged Cloud, which, when popped, yields the second Smiley Flower. Smiley Flower #3: If the player tips a third see-saw platform, they will encounter a bow near the lava. After licking this bow, it reveals a tunnel with Lava Bubbles. When the player passes the Lava Bubbles, there is the third Smiley Flower in a small entrance the player can get into by bouncing on a spring ball. Smiley Flower #4: The player should tip a see-saw platform found under a Spike Bar all the way to the left. This makes a bow accessible. If the player licks the bow, then it shows a platform leading into a secret room with the fourth Smiley Flower. Smiley Flower #5: The player will find a slope with two Spike Bars rotating on it. The player should dodge the Spike Bars and pop a Winged Cloud under one spike bar. The cloud has the fifth Smiley Flower. Wonder Wool #1: The player will find a bow which can be accessed by standing on a wool platform. Behind the bow is a passage with beads and the first Wonder Wool. Wonder Wool #2: When the player encounters a platform above lava with an Egg Block, they should tip the platform all the way into the left then jump up from the right to get the second Wonder Wool. Wonder Wool #3: The third Wonder Wool is found on the central of 3 spools of wool. If the player turns it enough, it reveals Beads and the Wonder Wool. Wonder Wool #4: After going through a door, the player will run to a platform before a Spike Bar where two Monty Moles will come out. If the player jumps in the middle, it will reveal a Winged Cloud, which yields the fourth Wonder Wool. Wonder Wool #5: The player will find two Spike Bars rotating on circular platforms. If the player jumps on top of the second it reveals a hidden Winged Cloud which when popped, gives the final Wonder Wool. Collecting all five Wonder Wools for this level unlocks Hot Cocoa Yoshi. Yoshi in Big Montgomery's Fort with a Winged Cloud. This page was last edited on April 13, 2019, at 02:04.